I needed to change out my bulletin boards but didn't really have any student work ready to go up. I know that my primary students have been learning about different presidents with Presidents Day a couple weeks away, so I dug through all the posters in my room and selected a few with presidential themes. On the left is "George Washington (Lansdowne Portrait)" by Gilbert Stuart, the middle is "George Washington Crossing the Delaware" by Emanuel Leutze, and on the right we have "Abraham Lincoln, February 5, 1865" by Alexander Gardner. I added some facts about each president, snippets about Presidents Day, something about each artist, and pointed out a few of the inaccuracies in the painting. I liked to hear the students as they walked by- "Abraham Lincoln! He's my favorite president!" 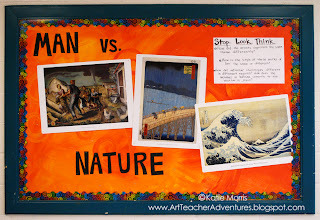 At my intermediate school, I selected prints with a common theme- Man vs. Nature. 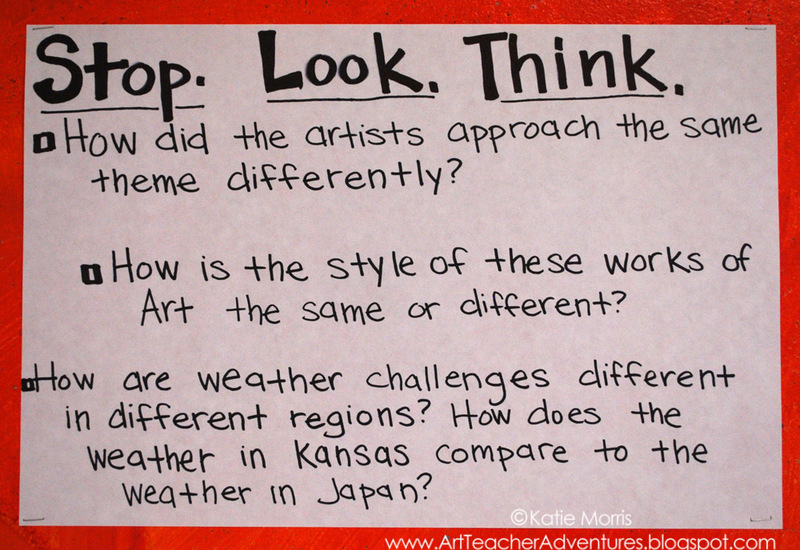 I had wanted to compare John Steuart Curry's "Tornado Over Kansas" with Hiroshige's "Great Bridge, Sudden Shower at Atake" and Hokusai's "The Great Wave off Kanagawa" since we focused on East Asian cultures last fall. I added a "Stop. Look. Think." sign with questions about the artwork. 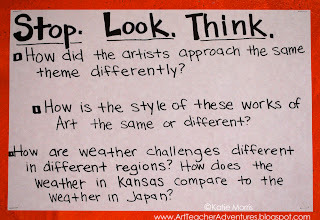 If I saw the students more often, we would have done this as a writing activity.